Situated on a west-facing view lot on Mt. 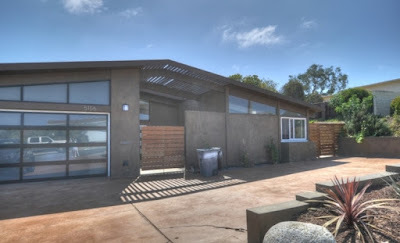 Soledad lies this 1963 Palmer & Krisel-designed mid-century modern home built by the Drogin Construction Company. 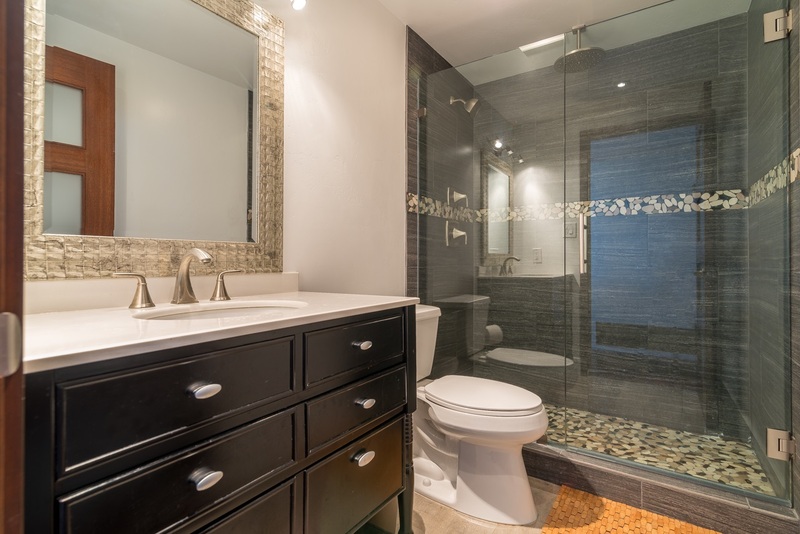 Purchased in February of this year for $1,300,000, this home has been renovated and reconfigured over the past six months into the product we see today. 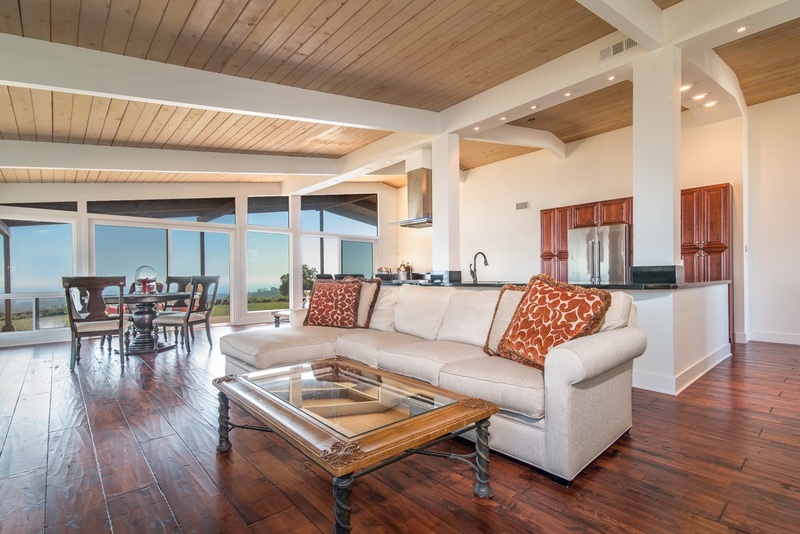 Featuring five bedrooms and two bathrooms in 2,100 square feet, a two-car garage and million-dollar Mission Bay views the new and improved asking price of this home is $1,895,000. 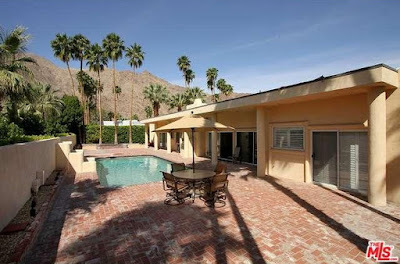 The entire front yard has been re-landscaped, with new retaining walls and new plantings installed, along with a newly brown-stained driveway, a new enclosed entry courtyard and new dark exterior paint on the home. 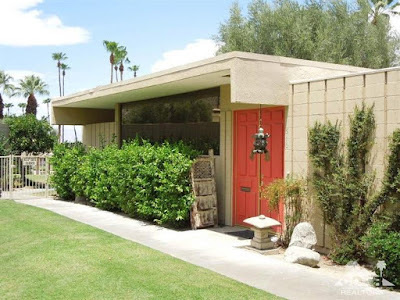 The selected colors read very weighty, and the front yard almost begs for a green relief or softened edge to break up the heaviness created by the dark colors. 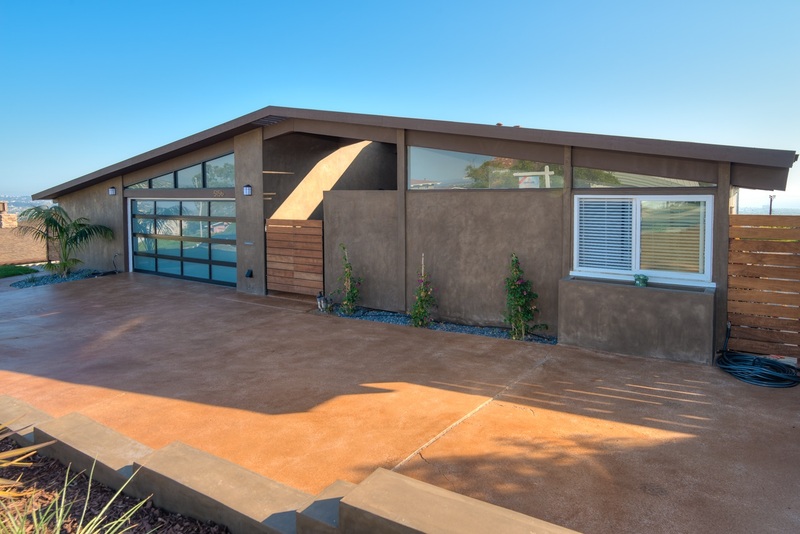 One cool feature gained was the opaque garage door, which compliments the garage clerestories and adds a sleek modern touch to the home. 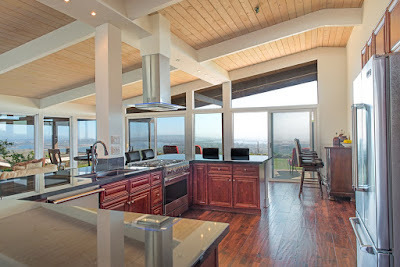 The living, dining and kitchen have all been opened up to one another, taking full advantage (at the sacrifice of privacy) of the sweeping views offered by the large floor-to-ceiling windows wrapping around the east and west sides of the home. 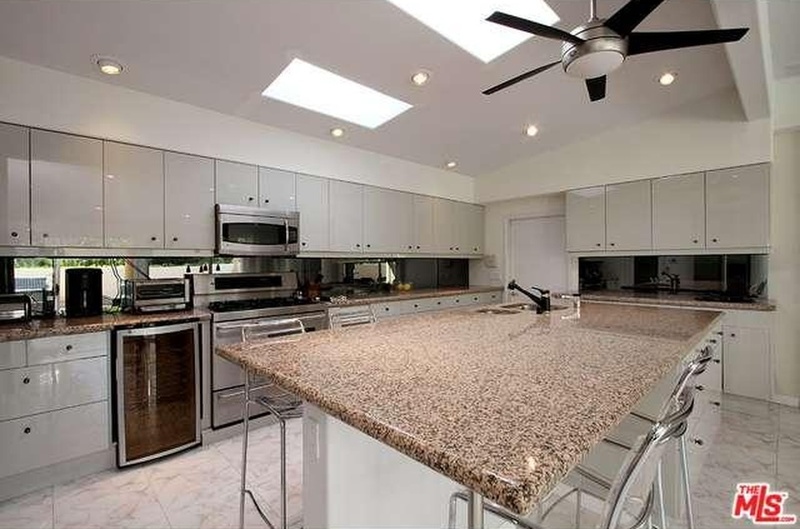 The kitchen now features a large central island, with black quartz counters, cherry cabinets and Viking appliances. The finishes are all very traditional, heavy and chunky, which at times seem at odds with the midcentury modern spirit of the home. 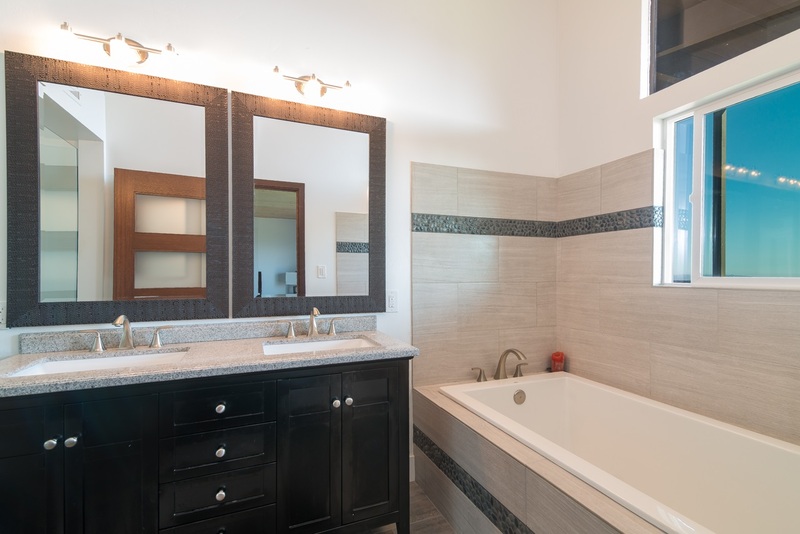 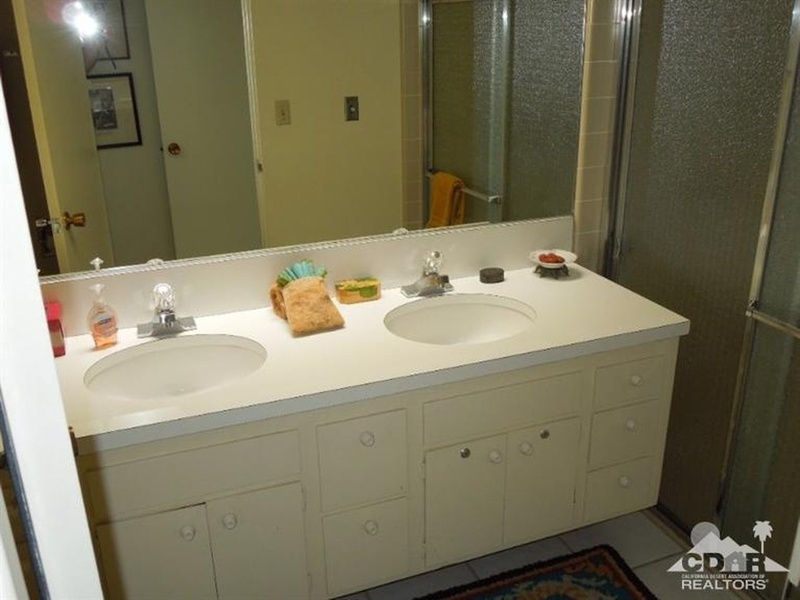 The bathrooms have both been renovated with basic materials – floor tiles utilized for the tub and shower surrounds, pre-built dark stained vanities with granite counters and big-box store mirror frames, all surprising finish choices in a nearly $2 million home. 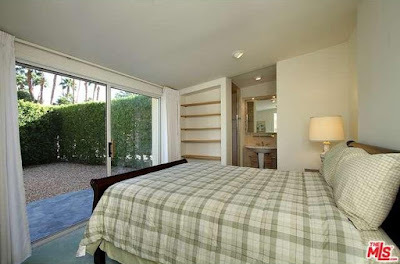 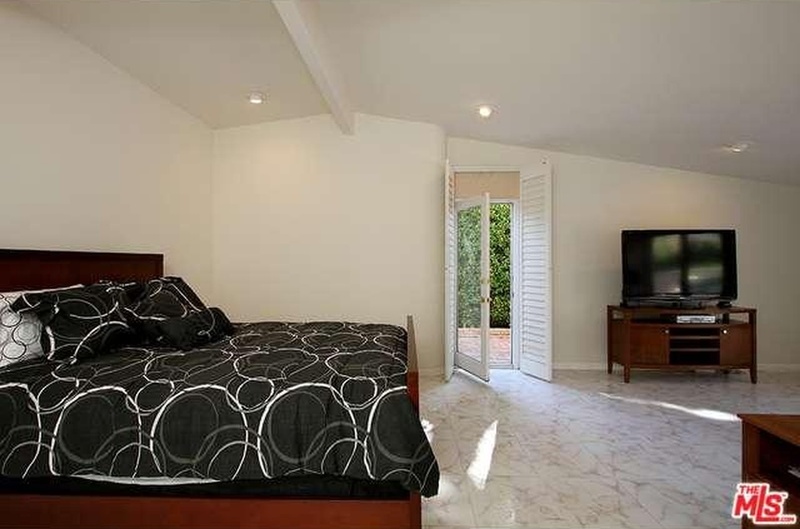 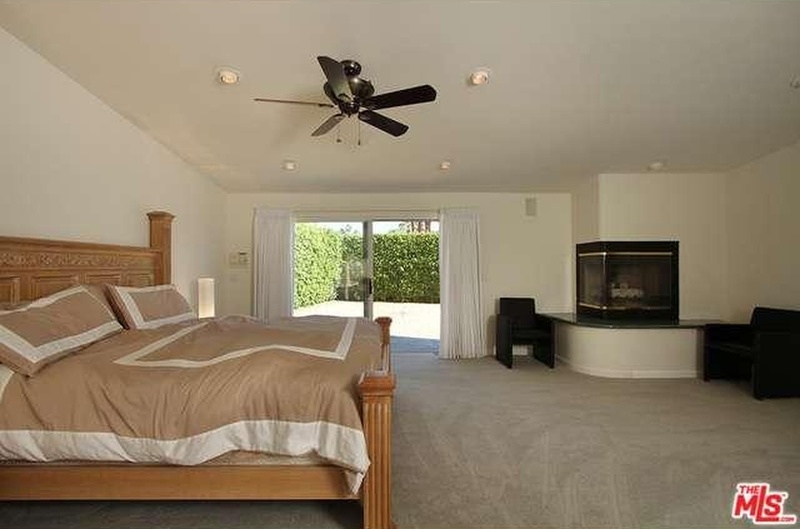 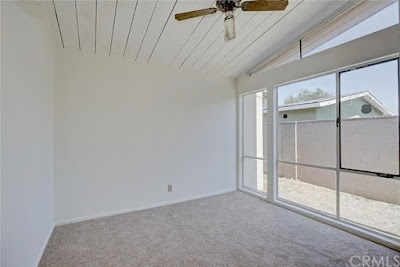 The master bedroom sits at the rear of the home and offers a sliding glass door out to the backyard, and retains its general original configuration as have the other bedrooms. New modern closet doors have been added, matching the new modern interior doors. The backyard is wide-open and unobstructed, fully offering up sweeping views of Mission Bay, Downtown and beyond. 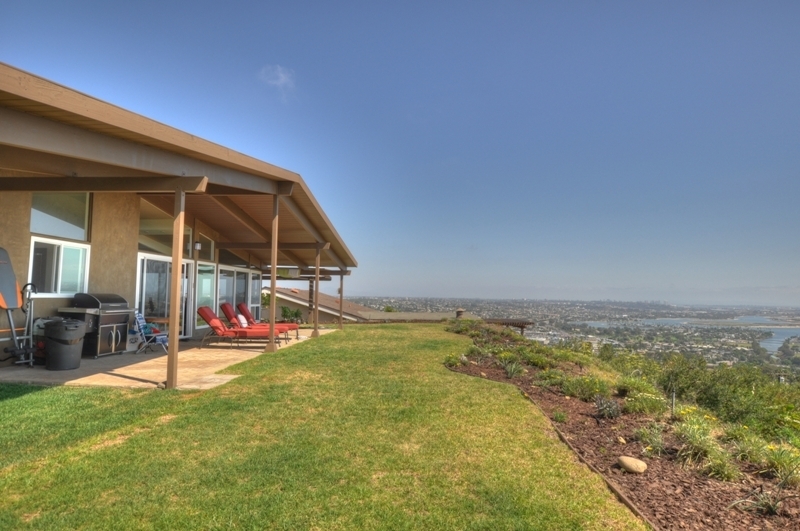 There’s a large covered patio for enjoying the year-round mild San Diego climate, and it’s really the views that sell this place. The renovation won’t appeal to all buyers as it architecturally doesn’t embrace the style of the home; rather it forces another style upon an existing one, which creates visual discontinuity at the points where the two merge. 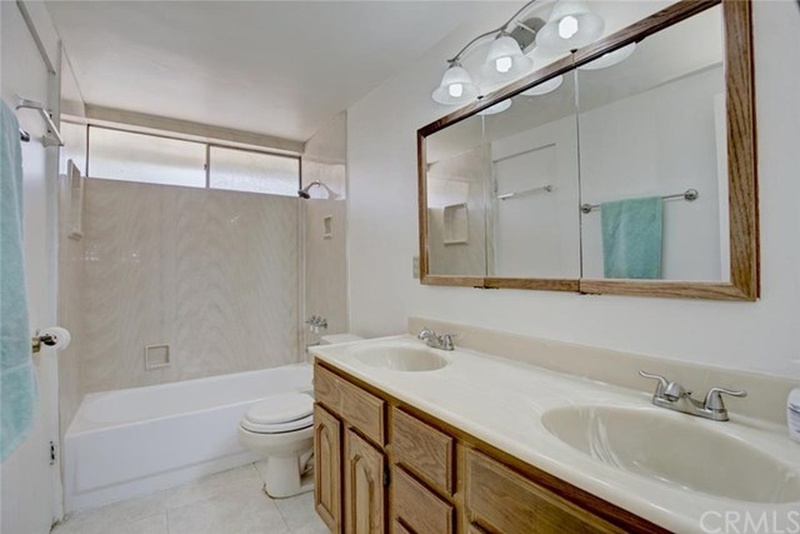 But chances are you'll be too busy enjoying the view to notice much else. 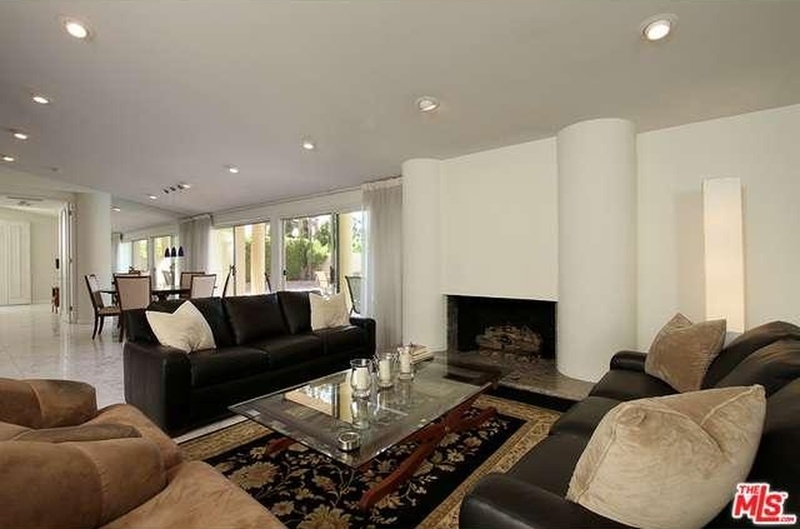 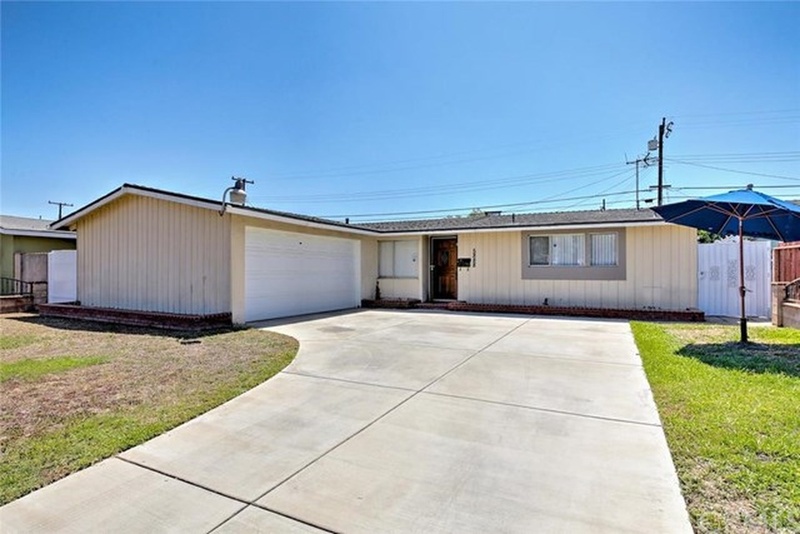 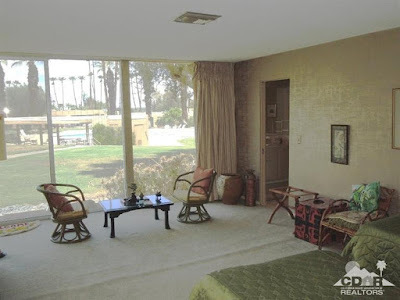 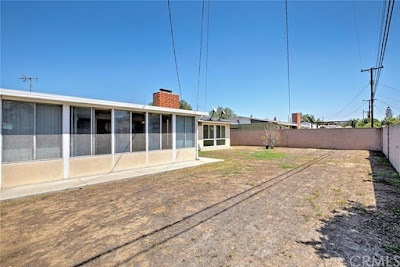 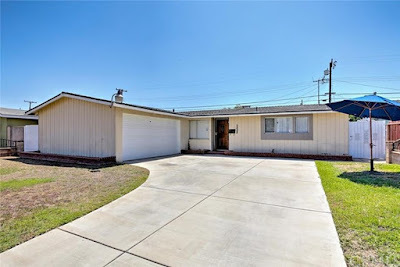 Built in 1955 by Louis Lesser Enterprises, this 1,190 square-foot Palmer & Krisel-designed home in Buena Park, CA packs three bedrooms (originally four) and two bathrooms under one roof with a two-car garage on a 6,000 square-foot lot with an asking price of $499,000. 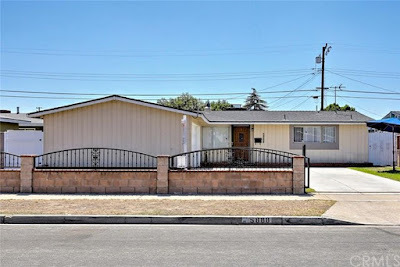 Outside, this home could use a little TLC in the landscape department, with its patchy lawn and block and metal fence enclosing the front yard. The exterior of the home features dramatic vertical board and batten siding, creating strong shadow lines and a great mid-century aesthetic. 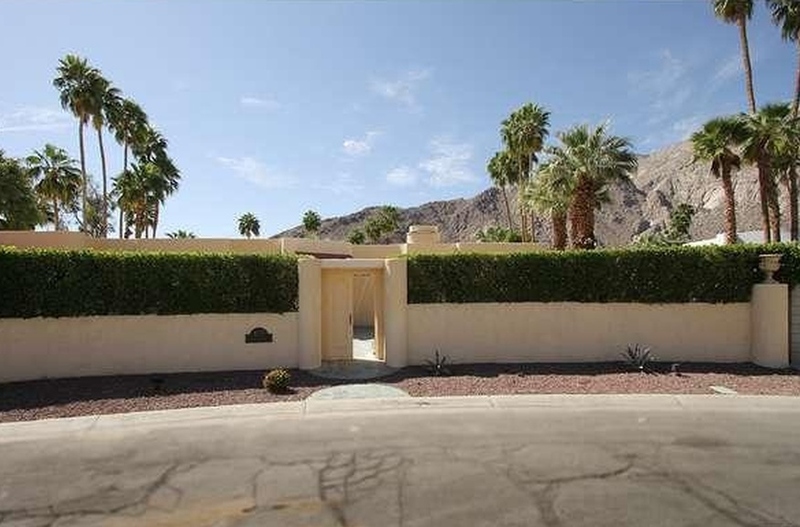 The high pressure sodium light at the garage is a bit over-scaled and not in keeping with the residential nature of the property, and the block fence is unwelcoming, but both are an easy removal for the new owner. 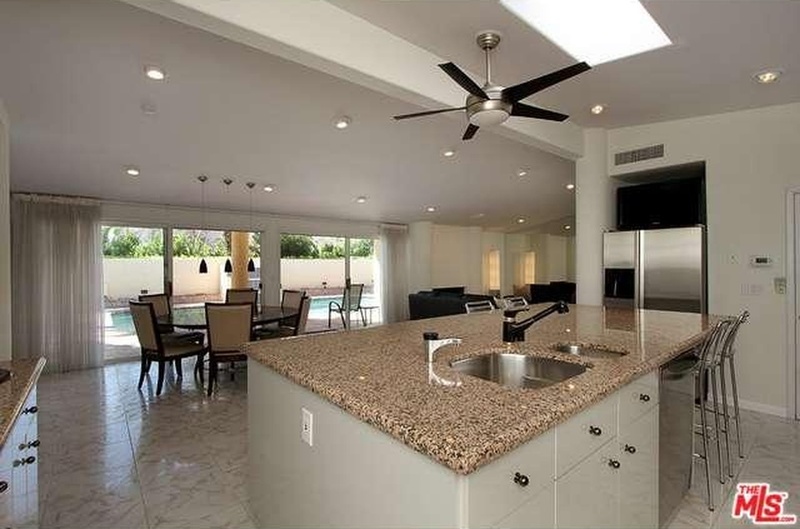 The living and dining areas sit at the rear of the home, while the kitchen is just off the entry. Several long, high, rectangular openings with decorative spindles have been created between living room and kitchen, allowing the two spaces to be open to each other while still providing privacy. 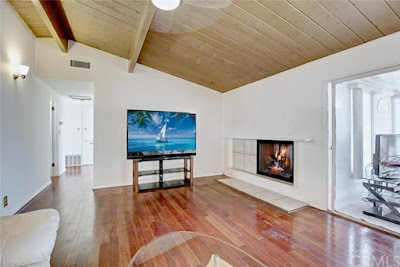 The living room is anchored by a modernist flush-mount fireplace surrounded by a simple thin steel square ring to which an ill-fitting mantle has been added. 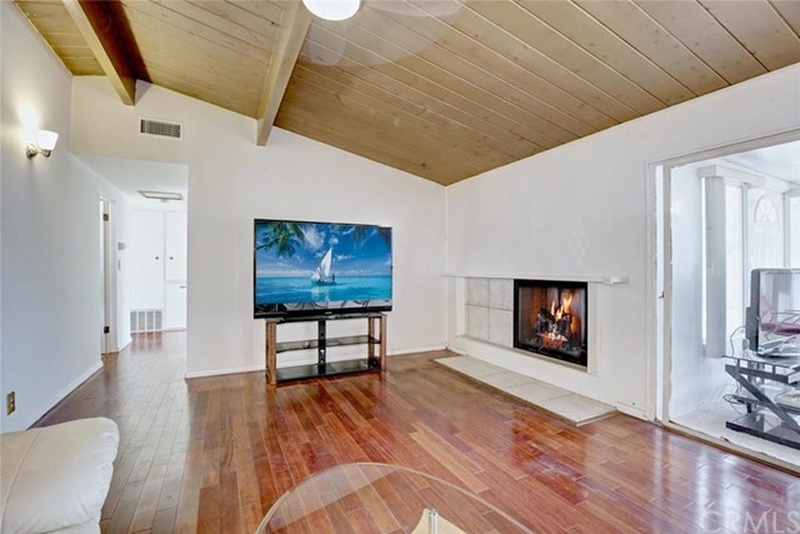 The firebox is purposefully off center and has been accented by large floor tiles, which originally would have been one-inch mosaic tiles. 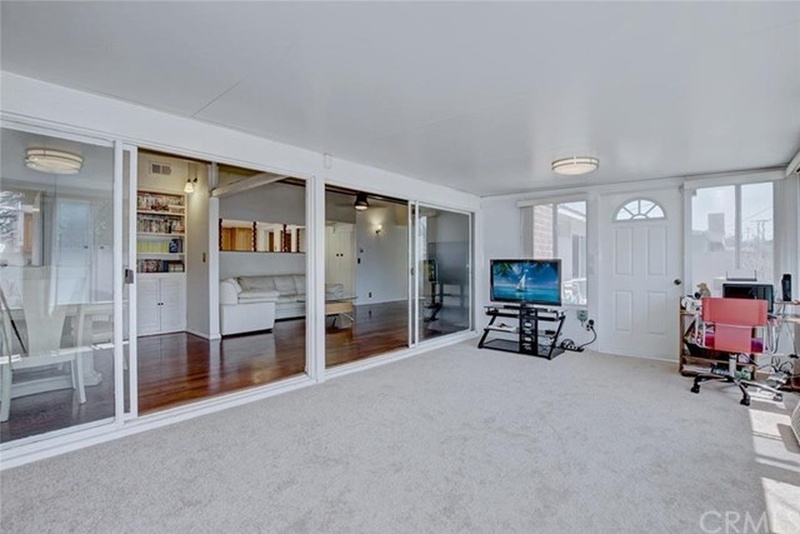 A large enclosed porch has been added to the living room, which cuts the amount of south-facing natural light entering the home but adds additional living space onto this efficient home. The dining room has been carved out of the former master bedroom, and it’s west-facing clerestory windows have been covered up. 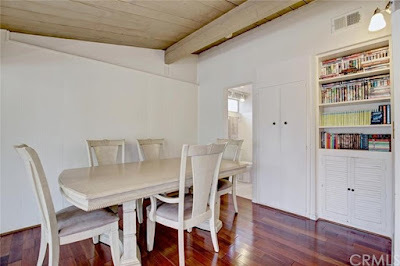 As the dining room was the former master, it also features a full bathroom and the original closets are still intact. 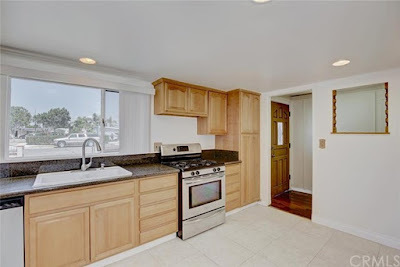 The kitchen features a lowered ceiling and has been laid out half-galley style, with raised panel cabinetry and granite counters. 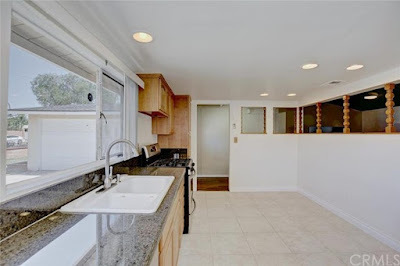 The laundry area sits at the end of the kitchen and features a door access the service porch and garage. The three bedrooms sit at the eastern end of the home, and the two end bedrooms still feature their original clerestory windows, allowing plenty of natural light to enter the home as intended. 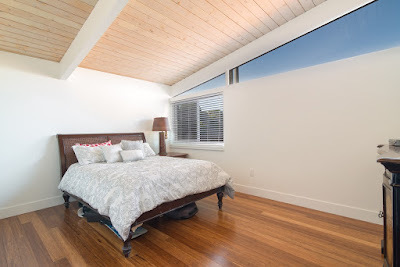 All three bedrooms still incorporate their original, open, beamed ceilings allowing for the diminutive spaces to feel larger than they appear. The bathroom servicing these three bedrooms has been updated, and provides jack-and-jill access to both the hallway and rear corner bedroom. 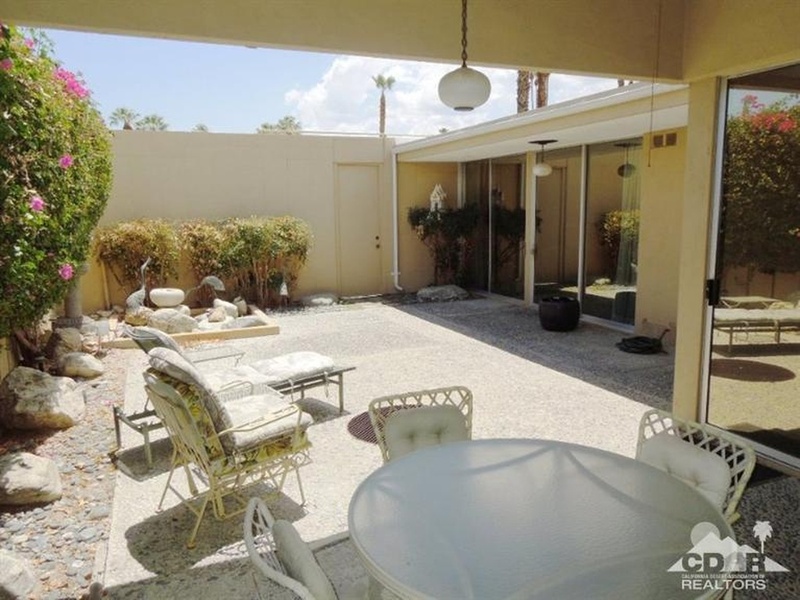 The backyard is just as sparse the front, completely devoid of shade trees or softening shrubs. 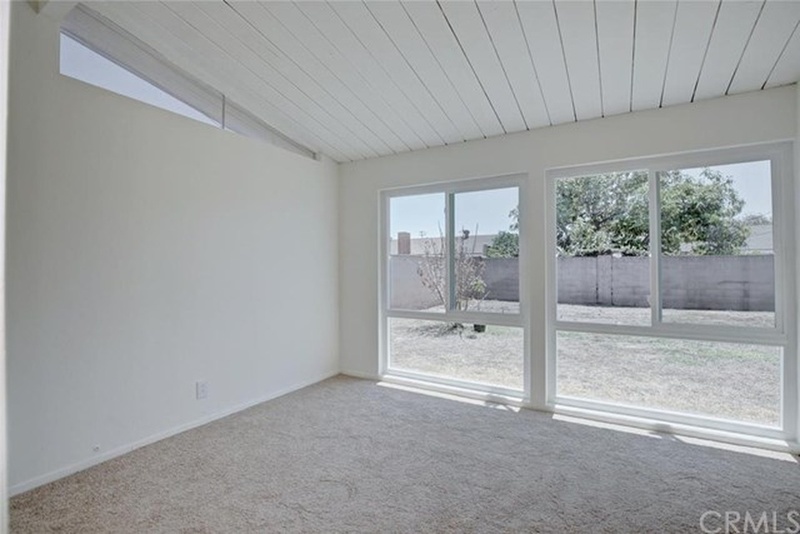 It’s an open blank slate waiting for a water-wise modernist makeover. This home has some fantastic clean lines, and is ready for a new owner to breathe new modernist life into it. 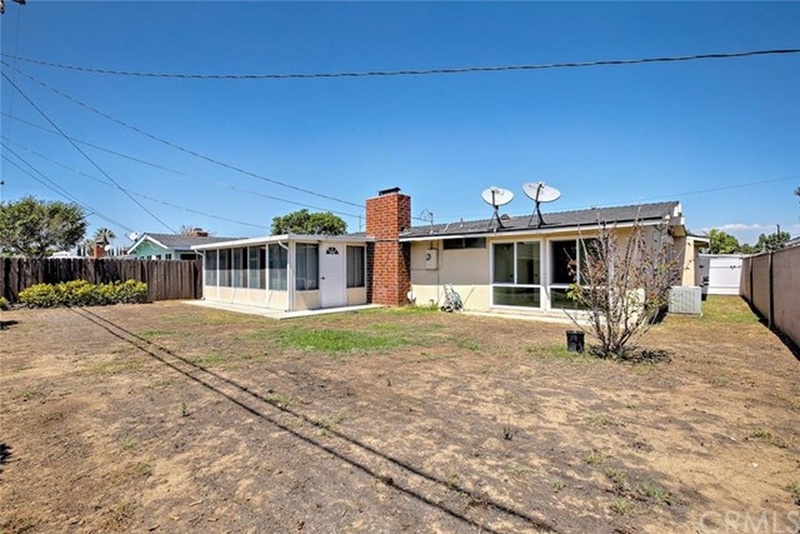 It’s move-in ready and will make a perfect long-term project or immediate restoration. 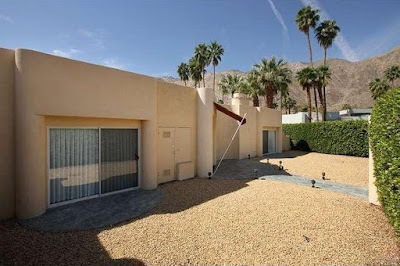 In 1998, before mid-century modern became ‘in’ again, this Palmer & Krisel-designed home built by the Alexander Construction Company in Palm Springs, CA underwent a massive renovation and expansion. Expanded from its original 1,600 square feet, this home now features three bedrooms and three and a half bathrooms in 2,718 square feet, a two car garage, an in-ground pool all on a 12,100 square-foot lot with an asking price of $1,095,000. 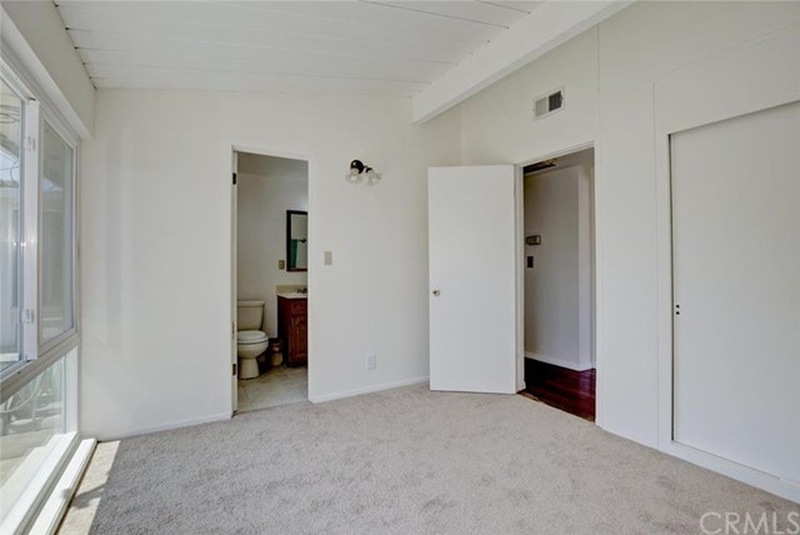 The home is great for those who value privacy. Situated at the knuckle of two intersecting roads, a low wall surrounded by a lush, green hedge separates the home from the street with gates at the front driveway and entry walkway. 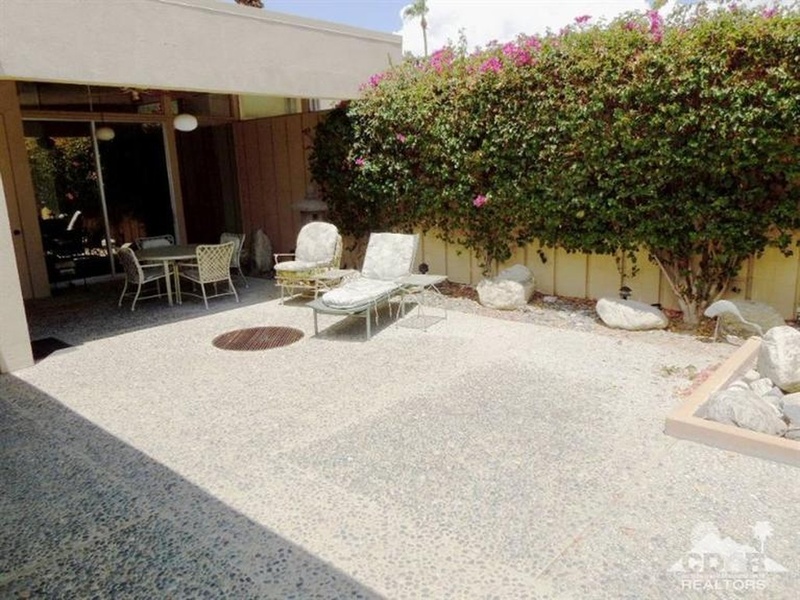 Behind the front hedge the front yard is low-maintenance and under-utilized gravel waiting for personalization. 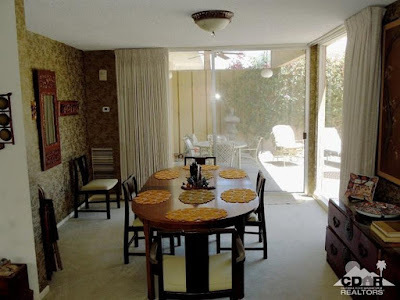 Walking into the home, the living, kitchen and dining areas retain their basic original form and location, all with 1998 updates. 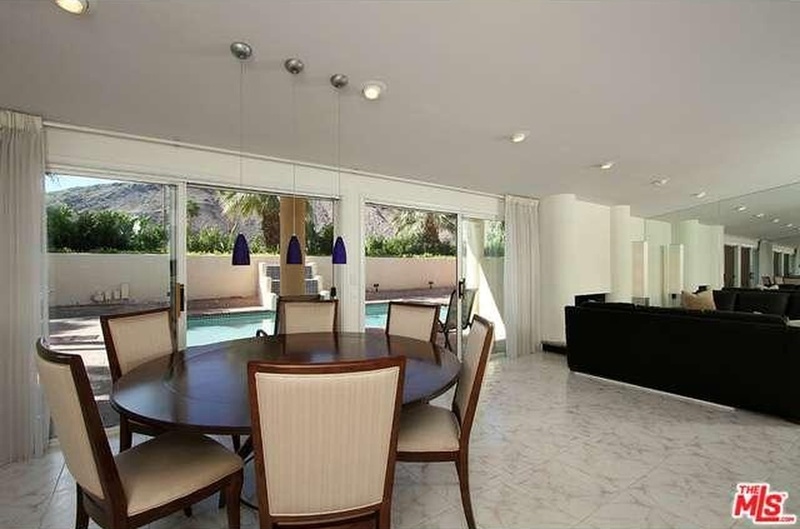 The living and dining rooms still feature their signature original walls of glass overlooking the backyard pool area. 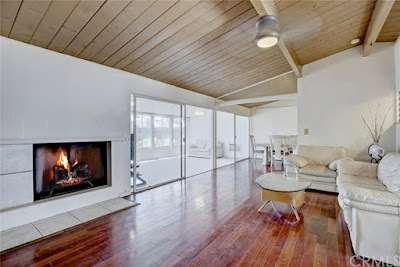 The fireplace is still in its original location, however the signature modernist blocked form has been modified with large, heavy rounded turrets, a theme established for many other corners throughout the home. 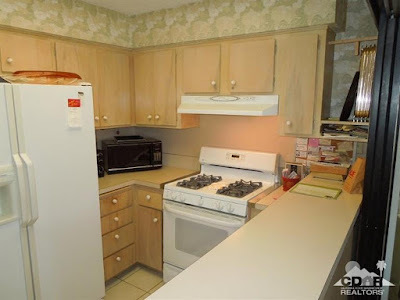 The kitchen has been upgraded and expanded, with a large central granite-topped island, walls of cabinets and skylights have been added for additional light. Two of the bedrooms have been converted and expanded into master suites, with their own sitting areas and private baths. 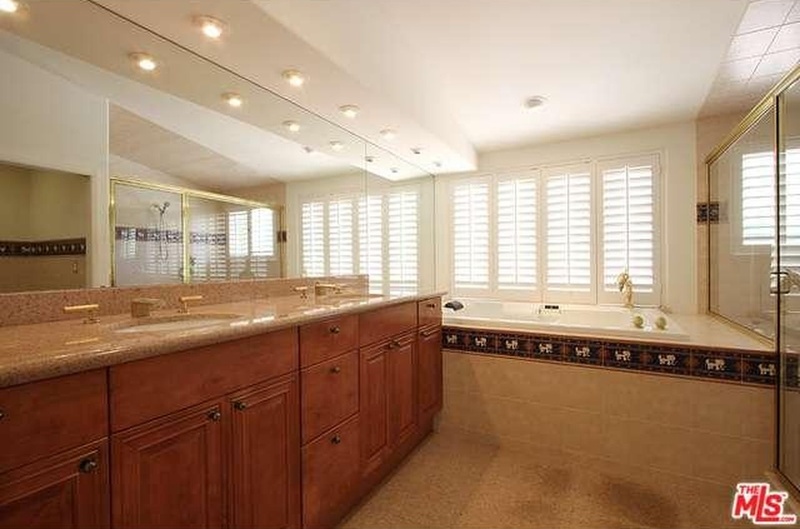 The baths embody the 1998 renovations made on the home, but are large, clean and functional. 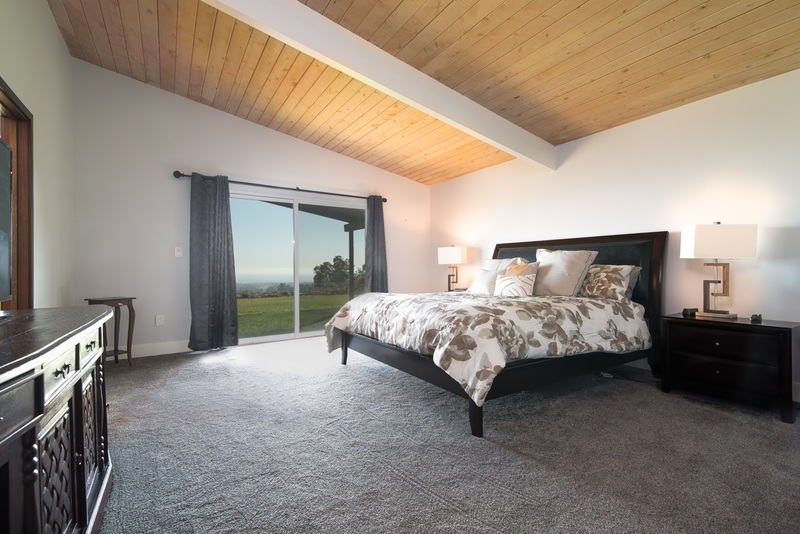 The larger of the master suites incorporates its own private fireplace, while the third bedroom retains its original form and location. 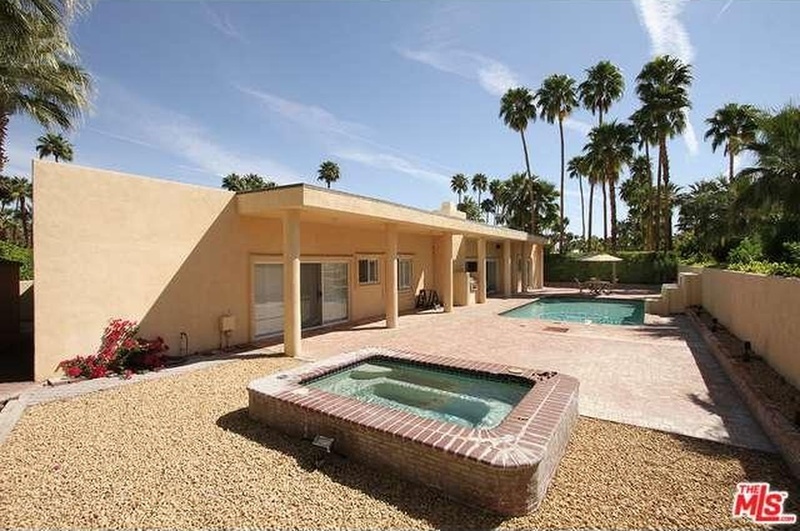 The backyard is anchored by the original rectangular Alexander pool, has an added spa and lots of red brick patio space. There’s not much greenery, except for some privacy hedges and a long, linear raised planter behind the swimming pool. 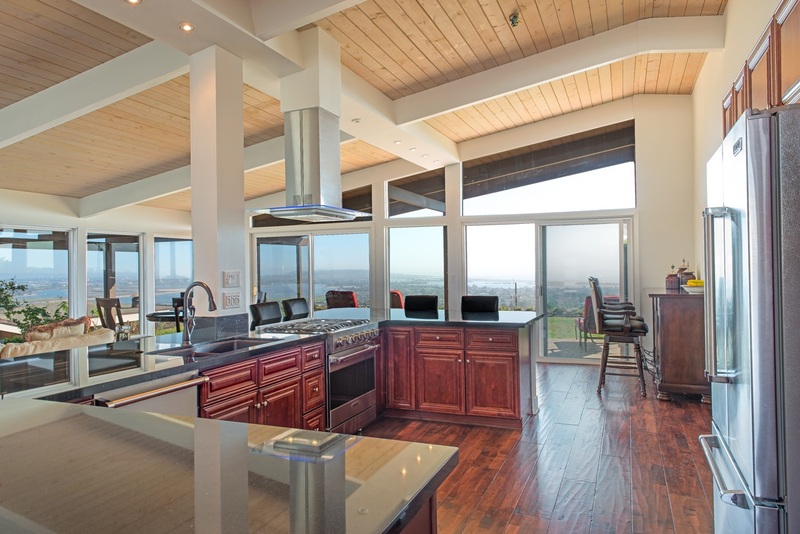 One of the best features about this home are the mountain views to the south and west, which are breathtaking, dramatic and inspiring. 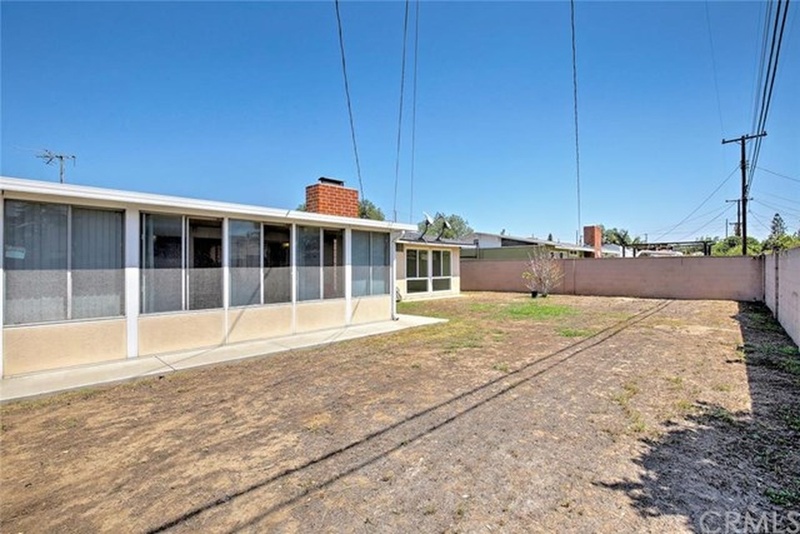 There’s plenty of opportunity with this home to enjoy it as-is, or embark on the endeavor of returning it to its modernist mid-century roots. 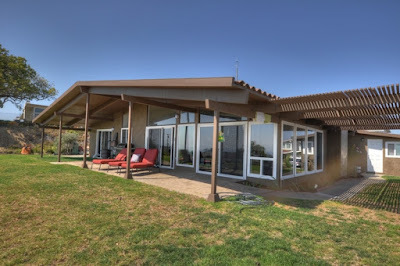 The yard is a blank slate awaiting a transformation, and is perfect for enjoying mountain views and tranquil evenings. This one’s been listed for quite a while now but it’s a great opportunity for those with vision. 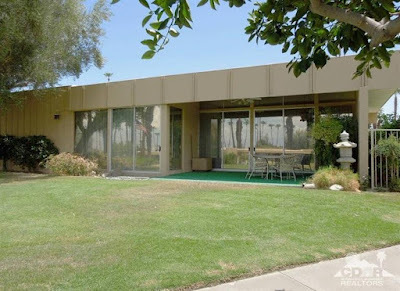 This 1962 Palm Desert Condomium designed by Palmer & Krisel is nearly as original as the day it was built. This three bedroom, three bathroom dual-master 2,020 square-foot unit features its own private interior courtyard, a large living room, two assigned parking spaces and expanded living room windows with an asking price of $439,000 and monthly HOA dues of $495. This unit features lots of great traditional mid-century details. The only noticeable modification made to this mid-century modern home sits just to the left of the raised-panel orange double entry doors – the living room clerestory windows have been lowered approximately 40 inches to create a chest-high window opening offering sweeping views of the nearby mountains. The proportion definitely feels off, but the view definitely makes up for it. 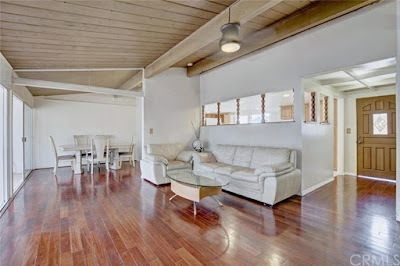 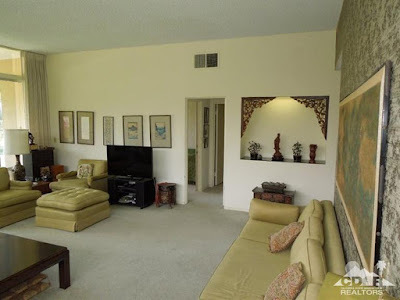 The living room sits at the southwest corner of the unit, abuts a private patio overlooking the common area and also features an interesting built-in niche along with some pretty vintage green patterned wallpaper. The dining room sits off the living room, overlooking the private interior courtyard, and is surrounded on two sides with generous walls of glass complimented by additional vintage wallpaper. 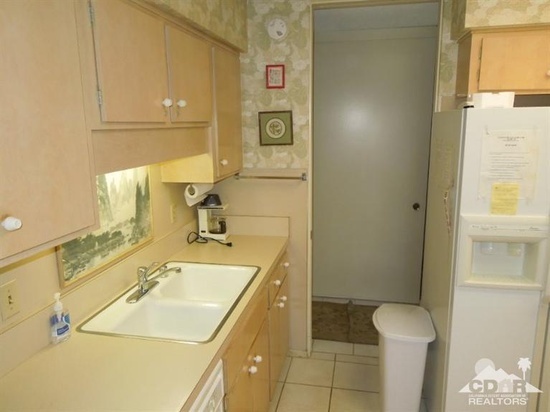 The kitchen still incorporates its original light wood cabinetry, formica counters and stainless steel-ringed sink. There’s also some more great vintage wall paper along with ceramic tile floors. 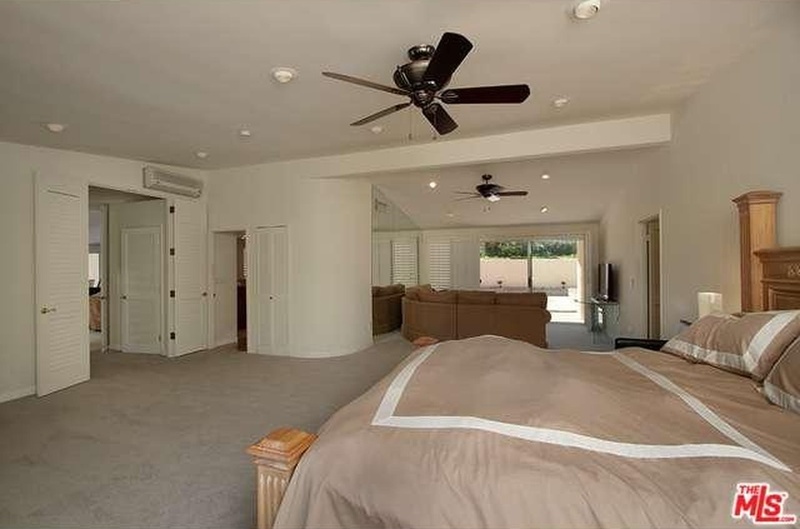 Two of the bedrooms overlook the private courtyard, while the third overlooks the common area greenbelt and patio area. 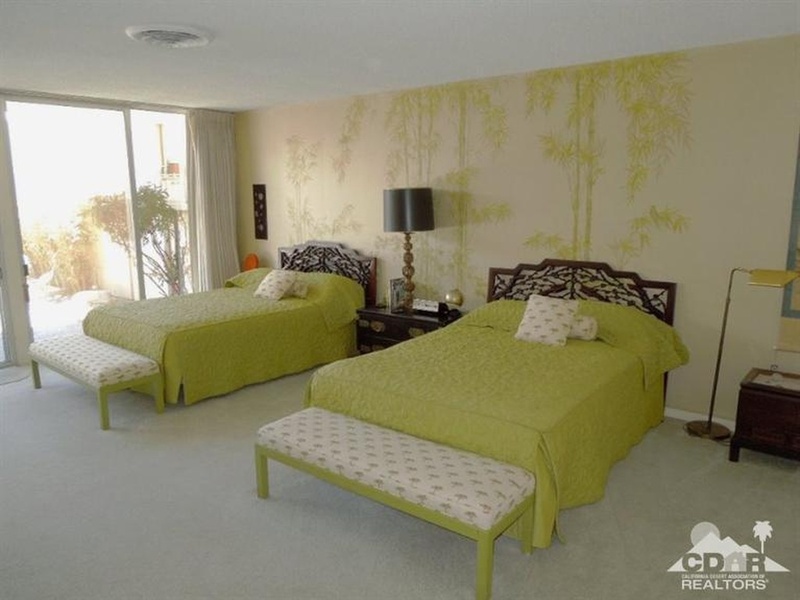 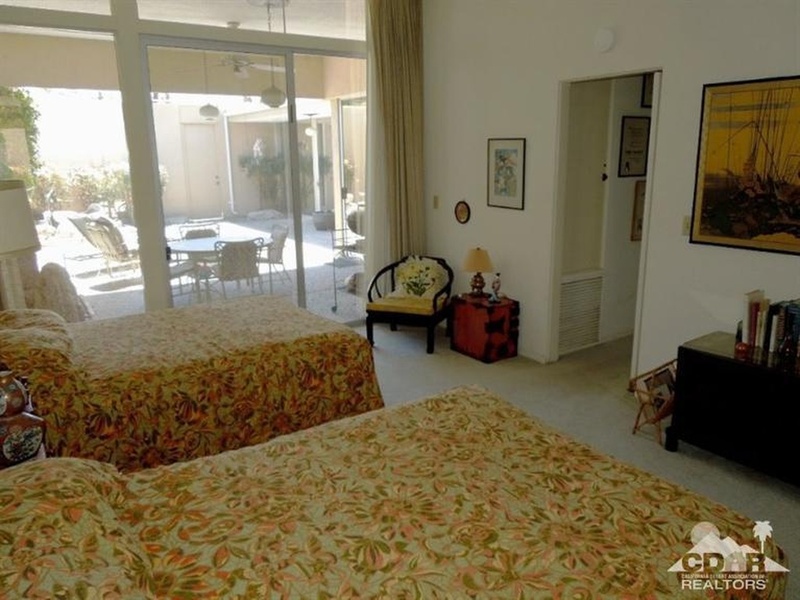 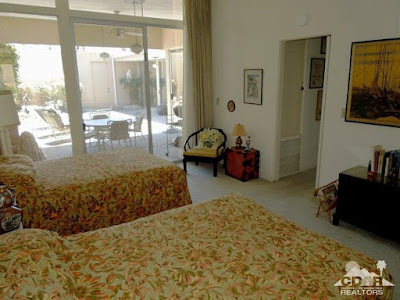 All three bedrooms are generous in size, and two feature more great vintage traditional mid-century wall paper. This is a dual-master unit, with one interior-oriented and one exterior-oriented master. 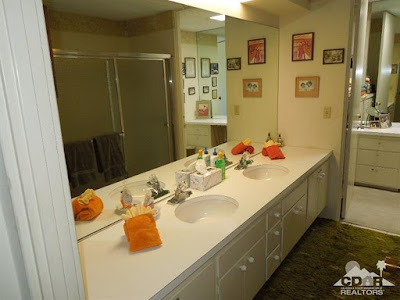 The master overlooking the common area features its original floating vanity, green shag carpeting and it’s own walk-in closet and dressing area.The other two bathrooms also feature their original floating vanities and more great vintage wall paper. The interior courtyard offers a moderate-sized patio with exposed aggregate pavement, decorative stone and boulders, and low-care landscape. There’s also a great collection of vintage hanging outdoor lighting that helps add the traditional mid-century aesthetic of the home. 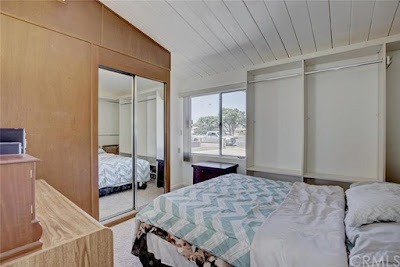 This is a great property for those that love traditional midcentury, or an excellent project if one wants to bring out the modern of this midcentury modern home. 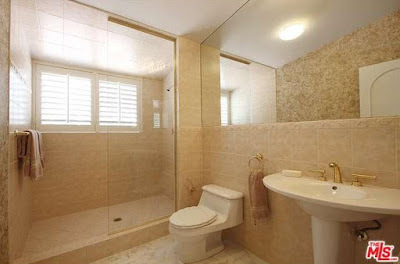 Whichever way it’s taken, it’s definitely a winner.